The chicks are about 22 days old now. This is the perfect time to band them – when they are big enough to not be fragile and before they get big enough to start exploring out of the box. They are certainly looking big and growing fast with all the food their parents have provided. Banding is a stressful time for all involved. 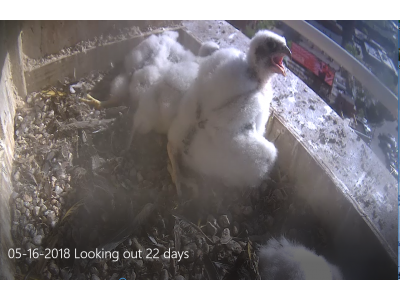 The chicks will be squawking, the parents will be screaming and diving, and the banders will be hoping not to get hit too hard by the adults. The biologists from the DNR will arrive early in the morning and are very skilled. The whole procedure is generally over in less than 30 minutes. And, they will clean the camera lens for us while they have the nest box open. Are you an educator who is using the webcam in your classroom? We are looking for some help coming up with names for the chicks. Please send us a message through the “contact us” button on the website if you have suggestions to submit.